It could be fairly said that nowadays the United Kingdom is a shadow of its former self. At least, as a native of said shores I can say it, anyway! We once governed half of the planet, and during the 19th Century British Engineers were at the forefront of science, technology ad engineering. Even during most of the 20th Century the image of a white-coated “British Boffin” was a shorthand way of depicting the men behind the forefront of cutting-edge technology. Nowadays, we are more often known for being plucky triers than at the forefront of many fields. One area where I think we can still claim to be at the vanguard, however, is in high-fidelity sound amplification. Many of the well-known names in quality Hi-Fi remain in British hands, and Acoustic Energy is one of those. 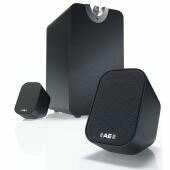 Their latest foray into the world of quality music is the Aego-M speaker system. This is marketed as an iPod speaker system, but to think of it as just that is to sell its capabilities short, in my opinion. They will well serve any audio source, be it an MP3 player, computer or a more conventional music source such as a CD player. Available in a black or white finish, you get a tiny pair of tweeter monitors, only a few inches high but remarkably heavy, with solid metal casings that angle the drivers up towards you on a desk. There is also a larger, wooden-boxed subwoofer, that also contains a beefy 100-watt amplifier. Many feet of high quality speaker cable are also included – custom dual-core connects to the spring-loaded connectors on the amp, with a single RCA connector going into the back of each monitor. The amp has a 3.5mm jack input on the front, and stereo RCA connectors on the back. All of the required connection cables are also included, and you can use both inputs at once (say for an iPod and computer at the same time – though you need to be careful to match the impedances otherwise overall volume is reduced). On powering up, connecting a source, and turning the smooth yet well-weighted pot on the front, the sound that emerges is quite astonishing. It is incredibly detailed and well-defined, yet manages not to sound overly clinical. The sub-woofer provides similarly defined bass, and can be adjusted to one of three settings depending on how close it is positioned to a bass reflector like a wall. 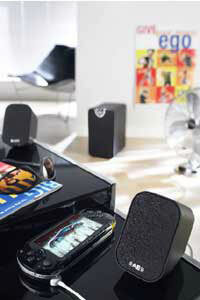 The definition remains at all volume levels, and turning them up produces a nice, large sound without distortion. All of this is at a bargain price below that of most of the ‘quality’ market – you’ll pay more for Klipsch or Bose products that are no better than the Aego-M, in my opinion. No, you don’t get an iPod dock or a remote, but then you can use these with a TV, your Mac and still connect your iPod, and the low price means that buying a Universal Dock from Apple is no hardship. There is a third, centre speaker output, though the enclosed documentation does not say how this should be used. Certainly, the system seems to be set up for stereo input only. This would be a competitive system at double the price – at $199 I think it is a steal. If you have even the remotest interest in listening to music reproduced well, you will be extremely happy with the Aego-M on either your Mac or iPod. I certainly can’t contemplate going back to my ordinary pair of JBL computer speakers.